Septarian concretions or septarian nodules are concretions containing angular cavities or cracks, which are called "septaria". This word comes from the Latin word septum; meaning “partition", and refers to the cracks or separations in this kind of rock. 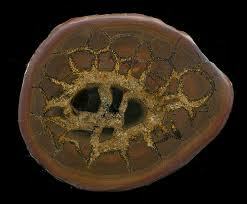 Septarians formed somewhere between 50 to 70 million years ago as a result of volcanic eruptions. Dead sea life was then chemically attracted to the sediment around them, forming mud balls. 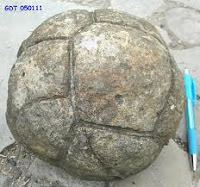 As the oceans receded, the balls dried and cracked. Due to their bentonite content they also shrank in size, creating the cracks inside. As decomposed shells seeped down into the cracks in the mud balls, calcite crystals formed. 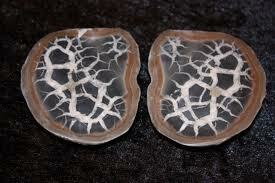 The outer thin walls of calcite then transformed into aragonite. 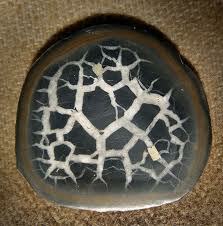 Septarians are composed of Calcite (the yellow centers), Aragonite (the brown lines), and the outer grey rock is Limestone. Septarians can be found all over the world in many different locations. 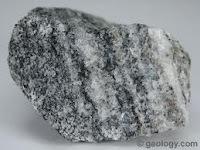 Gneiss is a typical rock type formed by regional metamorphism, in which a sedimentary or igneous rock has been deeply buried and subjected to high temperatures and pressures. Nearly all traces of the original structures (including fossils) and fabric (such as layering and ripple marks) are wiped out as the minerals migrate and recrystallize. The streaks are composed of minerals, like hornblende, that do not occur in sedimentary rocks. 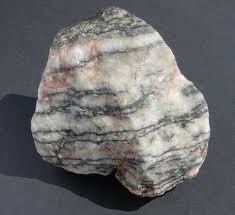 In gneiss, less than 50 percent of the minerals are aligned in thin, foliated layers. 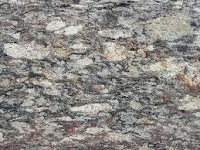 You can see that unlike schist, which is more strongly aligned, gneiss doesn't fracture along the planes of the mineral streaks. Thicker veins of large-grained minerals form in it, unlike the more evenly layered appearance of schist. With still more metamorphism, gneisses can turn to migmatite and then totally recrystallize into granite. 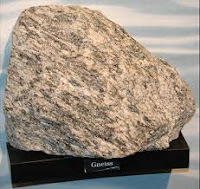 Despite its highly altered nature, gneiss can preserve geochemical evidence of its history, especially in minerals like zircon which resist metamorphism. 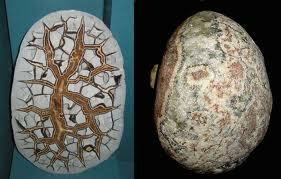 The oldest crustal rocks known are gneisses from western Greenland. 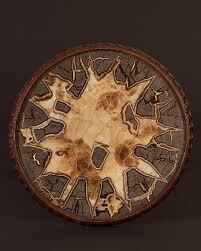 Their carbon isotopes show that life existed there at that time, nearly four billion years ago. 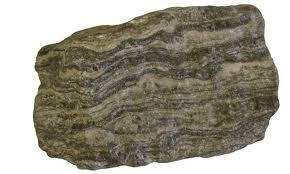 Gneiss makes up the largest part of the Earth's lower crust. Pretty much everywhere on the continents, you can drill straight down and eventually strike gneiss. Gneiss is an old German word meaning bright or sparkling.